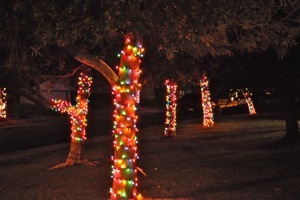 When your neighbors – those folks over on Sherwood Drive (pictured below) have been doing it big for years – as far as holiday lights are concerned – the gauntlet is drawn. When you’re just a block away, you just need to do it bigger. So until someone alerts us otherwise, Linfield Drive between Laurel and Sherwood is currently Menlo Park’s most lit holiday street. The result: people are walking and driving down Linfield Drive to enjoy the decorations. Last year Cary introduced an added attraction, an igloo that kids could play in. 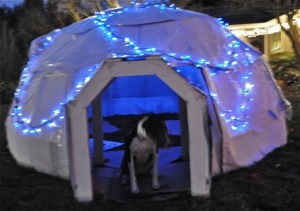 Due to the heavy rain this year, the igloo (with dog Max posing) was later in coming and has already endured a number of repairs. So, even if your kids haven’t visited Santa this year or gone nose to nose with Rudolph, you can promise them a romp in an igloo this Christmas Eve!